Mauve (H2) flowers, VIII–IX; pale straw-coloured foliage in summer, turning orange in winter; compact; height 16–20cm; spread 31–45cm. White flowers, VIII–IX; grey green foliage; upright; height 31–45cm; spread 31–45cm. Mauve (H2) flowers, VIII–IX; dark green foliage, tinted red and yellow in summer; erect, compact plant with many coloured young shoots; height 31–45cm; spread 31–45cm. Seedling growing near 'Mullion' with 'Boskoop' and 'Robert Chapman'; found at Baumschule (Hoyerhagen, Bremen, Germany) by Jürgen Krebs in 1983. The German name means firework pertaining to the variegated foliage. Amethyst (H1) flowers, X–XI; dark green foliage; spreading, erect habit; height 31–45cm; spread 46–60cm. Recommended for late flowers. Wild-collected; found on Sunningdale Golf Course, Surrey, England, by J. F. Letts (Westwood Road, Windlesham, Surrey); introduced by J. F. Letts in 1969. Name pertains to the late flowering period. Very compact, almost moss-like, with bright green foliage; normally it does not flower; height 10–15cm; spread 21–25cm. Occasionally has a more vigorous shoot with mauve (H2) flowers; these should be cut out so that the appearance is not destroyed. Ideal for troughs. ♤Bud-flowering (Knospenblüher); buds lilac (H8): IX-XI; foliage dark green; habit after 3 years to 10cm tall, 30cm across. Deliberately raised cross made and selected by Kurt Kramer; Knospenzwerg 14 (11-58-14). ® C.2016:02 Registered on 21st February 2016 by Kurt Kramer, Edewecht, Germany. Lavender (H3) flowers, VII–IX; yellow foliage in summer, deepening to orange-flame in the autumn; erect; height 31–45cm; spread 46–60cm. Raised by John F. Letts (Westwood Road, Windlesham, Surrey, England); introduced by Clive Baula (Hardwicks Nurseries, Newick, Sussex) in 1978. Mauve-rose (H2) flowers, VIII–IX; light yellow-orange foliage throughout the year; upright but spreading; height 26–30cm; spread 46–60cm. Found and introduced in 1986 by Darthuizer Boomkwekerijen, Leersum, Netherlands. Mauve (H2) flowers, VIII–IX; bright red young growth in spring retained long into summer, otherwise foliage dark green; height 21–25cm; spread 31–45cm. Introduced by Maxwell & Beale (Corfe Mullen, Dorset, England) before by 1976. Name is probably an allusion to the young foliage colour. Flowers lavender; VIII-IX; foliage grey foliage with yellow and flame coloured young shoots; habit upright. A sport found on 'Silver Knight', at Twin Acre Nursery, near Knutsford, Cheshire. Lavender (H3) flowers, VIII–IX; dark green foliage, new spring shoots are pinkish red (redder than 'Spring Torch'); height 26–30cm; spread 46–60cm. Mauve (H2) flowers, VIII–IX; bright green foliage; forms an appealing neat hummock of tightly packed shoots but flowers are very sparse; height 10–15cm; spread 16–20cm. ❁ Lavender (H3) flowers, VIII–X; dark green foliage; neat habit; height 31–45cm; spread 46–60cm. 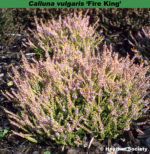 The history of double-flowered Calluna vulgaris is very complicated; William Curtis (Brompton, London, England) apparently had a plant as early as 1789. The name 'Flore Pleno' appears to have been first published in France in 1814. Named from flos = flower; plenus = double. It is at least debatable that the name 'Flore Pleno' is not now properly applied. White flowers, VIII–IX; bright green foliage; prostrate habit; height 10–15cm; spread 26–30cm. One of the St Kilda heathers. White flowers, VIII–IX; yellow-green foliage; compact, erect; height 26–30cm; spread 31–45cm. Seedling; found on Haythorne Nursery (Verwood, Dorset, England) by Mrs W. E. S. Bamford in 1990. Named after the mother of the finder. ❁ Shell-pink flowers, VIII–IX; yellow-tipped shoots; compact; height 10–15cm; spread 21–25cm. Less vigorous than 'County Wicklow', from which it was a sport. Named after the finder's youngest son. Mauve (H2) flowers, VIII–X; mid-green foliage, with salmon-tipped shoots in spring and throughout the summer; broad upright habit; height 40cm; spread 45cm. Seedling found by David Edge (Forest Edge Nurseries, Verwood, Dorset). The name alludes to the yellow /orange /red tips to new growth, linked with nursery name. ® C04:2004 registered November 2004 by David Edge, Forest Edge Nurseries, Wimborne, Dorset, UK. Pale purple (H10) flowers; VIII–IX; foliage yellow; habit low and spreading; height 26–30cm; spread 31–45cm. Seedling found under 'Foxhollow Wanderer' by Homer Ferguson (Fort Bragg, California, USA) in 1994. Registered 31 August 1999: Homer L. Ferguson, 19051 Babcock Lane, Fort Bragg, CA 95437, USA. Named after the Californian town where it was found. White flowers in long erect spikes up to 25cm long: VIII–X; lime-yellow foliage throughout the year; erect open habit; height 31–45cm; spread 31–45cm. Floriferous. Recommended. 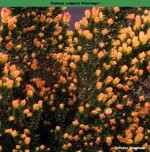 Sport on Calluna vulgaris 'Long White' found by Jim Thompson (Manchester, California, USA )n May 1991 and named in honour of the Californian gold rush of 1849. Registered 8 November 1995: Mrs R. Daneri on behalf of Col. James Thompson, P.O. Box 21, Manchester, California 95459,USA. Named in allusion to the California gold rush of 1849. The first word is not hyphenated. Pale purple (H10) flowers, VIII–IX; bright green foliage; spreading; height 16–20cm; spread 31–45cm. Good ground-cover plant, found on a copper mine in Cornwall by John F. Letts and named after his house in Surrey. Purple (H10) flowers, VIII–IX but very sparse; soft mid-green foliage; a very neat hummock; height 10–15cm; spread 21–25cm. Suitable for troughs. Unlikely, as often stated, to have been named after Walter Fox (1858-1934) as he would only have been 9 years old when it was introduced to cultivation! There are numerous other Foxes who could be the discoverer, but no likely person has been identified. Bright mauve (H2) flowers, VIII–IX; emerald green foliage; forms a tiny mound; height 10–15cm; spread 16–20cm. As the name implies it is much more free flowering than 'Foxii', but at the expense of the neatness of the mound. 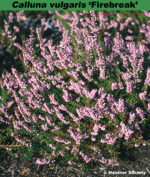 For 'Foxii', see under Calluna vulgaris 'Foxii'; floribundus = flowering profusely. Mauve (H2) flowers, sparse, VIII–IX; bright green foliage; beautiful miniature plant; height 10–15cm; spread 26–30cm. A little larger and looser than 'Minima'. 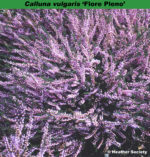 For 'Foxii' see under Calluna vulgaris 'Foxii'; nanus = dwarf. Erroneous named for either ‘Mousehole’ or 'Velvet Dome’. Pink flowers, VIII–IX; green-gold foliage in summer, turning orange-red in winter; upright; height 16–20cm; spread 21–25cm. Lavender flowers, VII–VIII; gold foliage, turning intense orange-red in winter; open erect habit; height 31–45cm; spread 46–60cm. Lilac-pink (H11) flowers, VIII–X; dull dark green foliage, young shoots have tips of red, cream and pink in spring; height 31–45cm; spread 31–45cm. Found shortly after the Second World War by Fred Chapple, first President of The Heather Society. Lilac-pink (H11) flowers, X–XI; pale green foliage; erect habit; height 46–60cm; spread 61–75cm. Slightly tender. Named after the place in France where it was found. Mauve (H2) flowers, VIII–IX; glabrous green foliage; upright; height 31–45cm; spread 46–60cm. Wild-collected; found in Scotland by Betty Baum (of Aviemore, Inverness-shire, Scotland) before 1966; found at the same time as 'Betty Baum'. The name is not descriptive of foliage. ♤ Flowers-buds blue-violet (H3 lavender), 4mm long, 1.5mm across; IX-X; foliage dark green with mid-green new growth; habit upright; height 30cm; spread 25cm after 3 years (pruned). PBR granted 27 April 2011. Deliberately raised seedling in October 2005 by Helmut Hiedl; selected in October 2006. ® C.2014.02: registered on 9 January 2014 by Helmut Hiedl, Altrusried-Krugzell, Germany. ♤ Bud-flowering H11 (lilac-pink), (Knospenblüher); IX-XII; foliage dark green, with mid-green new growth; habit upright; height 30cm; spread 25cm after 3 years (pruned). Late-flowering seedling (07-40-1) raised in 2007 and selected in 2009. ® C.2012:01 registered on 19 February 2012 by K. Kramer, Edewecht-Süddorf, Germany. ♤ Bud-bloomer; lilac; IX-XI; foliage mid-green; habit broad, upright. Sport on 'Fritz Kircher', found on 1 November 1999 at Kurt Kramer's nursery. Registered on 26 July 2003 by Kurt Kramer. 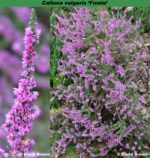 ♤ Purplish pink buds, fading to white at the base, in long spikes, VIII–XII; mid-green foliage; neat, compact, erect plant; height 26–30cm; spread 31–45cm. Considered to be an improvement on 'Marleen'. Raised by Kurt Kramer (Edewecht-Süddorf, Germany) before 1993; submitted for plant breeders' rights in Germany on 30 November 1993; EU rights granted on 1 September 1997. Named after Fritz Kircher, founder and President, Gesellschaft der Heidefreunde in honour of his 80th birthday. Several clones are grown under this collective cultivar name which should be described as var. hirsuta. The one common factor is that the cultivar will have downy grey foliage with mauve flowers; height 31–45cm; spread 46–60cm.